KB's, Weight and Glory is centred on this truth. If what we know about God is true, then our only job is to increase in our faith and live for His glory. This album offers an eclectic blending of worship music with the aggression and energy of hip-hop. There is a balanced combination of powerful vocals and finger-snapping beats. Production from Joseph Prielozny, Andre Atkinson, Alex Medina, Dirty Rice, and Black Knight create a dynamic atmosphere that is conducive for both self-reflection, and going off for the Lord. If God is for us than who can be against us? Let go of inhibition. Challenge heretical doctrine. Fight against unrighteousness. Our lives are not meant for self-exaltation or self-preservation. Our lives are meant to bend under his Weight & Glory. 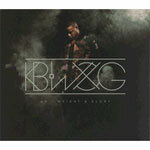 Featuring guest appearances by Lecrae, Flame, Trip Lee and others.